I made coleslaw for the first time, and it was pretty easy with the Vitamix. Most things I make in the Vitamix I process until they are maximally smooth, so it’s a bit of a change of pace to make something intentionally chunky. I was concerned about over processing, but it turned out to be a non-issue. I’m not a big fan of mayonnaise, so I made a vinaigrette dressing. To shred the vegetables, process them separately (although I combined the carrots and jalapeños because the jalapeños were so small). I used variable speed 5 for the carrots and onion with the dry-chop method. You put the lid on the empty container, start the machine, and then drop chunks of the vegetables in. I cut the carrots into thirds and the onion into quarters. Once they’re chopped dump them into a bowl. I wet-chopped the cabbage, which means that I put chunks of cabbage into the container, covered them with water (after quartering and coring the cabbage), and locked the lid on. I pulsed them on high 4 times (left switch on high, on-off switch rapidly turned on and off). The one thing to watch out for is the chunks I used at first were a bit too large to process/circulate evenly. I salvaged them by straining them and re-processing the bigger chunks. I looked back at the Vitamix manual and found that they recommend cutting cabbage into 1.5-inch chunks. They also recommend just running the wet chop at variable speed 5 for 5-10 seconds instead of the pulsing on high that I used, so I’ll try that next time. Once they’re processed you can drain them in a colander. I had a little extra time, so I soaked the shredded onions and cabbage in salt water for about 30 minutes, which takes the edge off the raw onions and reportedly makes the onion and cabbage more crisp. (I’m curious to try some side-by-side tests, but haven’t gotten around to it yet.) After 30 minutes I rinsed them in a colander. While those were soaking I blended up the dressing. One thing to watch out for here is that we’re blending the bare minimum volume that the Vitamix can handle–4 oz–, which means that it’s a good idea to chop up the garlic a bit before putting it in. Normally I would just toss the whole clove in, but when I did that in this case it had a little trouble with getting stuck under the blades since there was so little liquid circulating. Bittman recommends gradually adding the oil while mixing the other ingredients; I’m not sure if it’s really necessary with the Vitamix, but I did it anyway to be on the safe side. So I added all dressing ingredients except for oil, started on low, gradually added the oil, then briefly ramped up to high. Toss everything together in a bowl and enjoy! I was pleased with how this came out. Thank you for the clearly detailed instructions and suggestions. 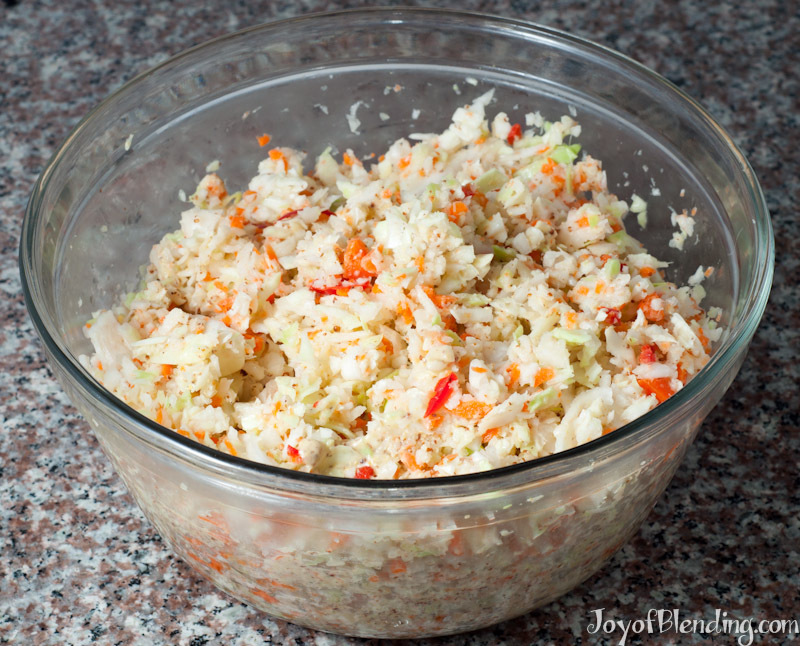 We recently had some sweet/sour slaw, not mayo based cole slaw, at C&H Cafeteria in Durham that I would like to replicate. It was very light on red onion and used green bell pepper and carrot plus the cabbage. 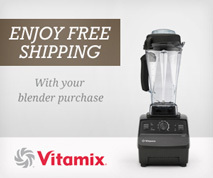 My wife and I took one look/taste and simultaneously said “Vitamix”. Thanks again for the suggestions, dos and don’ts. I haven’t wet chopped anything yet because it seemed like a bother because it was so easy to just do it by hand or throw in the food processor but this recipe makes me want to try it in the Vitamix. By nature, I’m not a person who must have everything instantly so I just haven’t bothered with these features but it’s time for me to give this a try. Chopping cabbage and other vegs. is one of the reasons I am even considering a Vitamix, but all I ever see are the “wet chop” directions. I do not think that is a good idea because you would be throwing away the vitamins with the water. You could use the water for soup, etc. I guess but it seems like a potential great waste of water and nutrients otherwise. Also, I don’t see how this would be any different from a blender or food processor since you could easily add water to any blender and chop up the cabbage. I can find NO instructions for chopping cabbage in a Vitamix without this water “wet” method. This may be a deal breaker for me as I consider whether or not to buy one. Cabbage is typically wet-chopped because people usually do it in large quantities, and the water helps it circulate. It’s true that you loose a little bit to the water, but it’s really minimal. For example, when I’ve wet-chopped purple cabbage the water comes out light purple, but if I compare that color to the color of water that has the cabbage fully pureed in it, there is no contest—I’m guessing that we’re talking under 1% lost to the chopping water. Combine that with the fact that the veggies people usually wet chop—cabbage and potatoes—are some of the cheapest produce around, and I think it’s a non-issue. However, if you want to avoid wet chopping you could consider one of the Next Generation models, which have a wider container that will allow you to dry chop more at a time. Ultimately there are some chopping tasks that a good food processor would probably do a better job with, but you can make it work in a Vitamix. The advantages of a Vitamix for chopping are that it’s easier to clean, and it does so many other things well. The “all-in-one” nature of the Vitamix means that many people store them out on their counter so that they’re always ready to use, and you can minimize the number of different kitchen appliances you have to store. Will I be able to accomplish this with only having the 2 speed blender? You won’t have as much control over the size of the chop, but it should still be possible. Either use the low speed, or pulse it on high by quickly turning it on and off. I’m looking for a creamy dressing for. My cabbage salad. I have a vitamix now and would. Like to try. To make it today! What can I use to make any of the number of salads without mayo?